Watching our children grow is a wonderful experience but it is watching them learn and thrive that really stops my heart. Those moments where their faces light up and you see them not just absorbing their surroundings but also engaging and transforming into who they will become. Two Little Hands Productions and their series Rachel & the TreeSchoolers can practically guarantee that this will be your everyday life while watching their programs. We recently received a complimentary copy of their newest episode, “Our Solar System”, which includes both a DVD and CD. I was highly impressed not only with the quality of information but with how quickly The Littles assimilated the details. The video starts off with the TreeSchoolers trying to solve “The Mystery of the Missing Moon” and with a quick introduction to what astronomy is. The spectacular vocabulary throughout the film is perfectly matched by the in-depth descriptions provided and the classic sign language usage we have become so fond of. Within minutes our oldest girls were signing “orbit”, “stars”, “moon”, and other space themed terms. Without giving too much away, I can tell you that they solve the mystery by studying how our solar system works and how the universe is designed. The TreeSchoolers focus on why the moon is waxing or waning, why the sun does not actually “rise and set”, and what makes shooting stars special. They even discover gravity and how it plays a major role in keeping the system running smoothly! Rachel goes into a few songs including a great one which highlights important historical events and people in astronomy. Some of the people and events featured are Nicolas Copernicus, Isaac Newton, Albert Einstein, Sputnik, and the Mars rover expedition. My five-year-old will now proudly tell you how the planets orbit the sun, that Pluto is a dwarf planet, and that we first launched a rocket with a man inside in 1961 after only one time watching this video. That is pretty awe-inspiring to me! 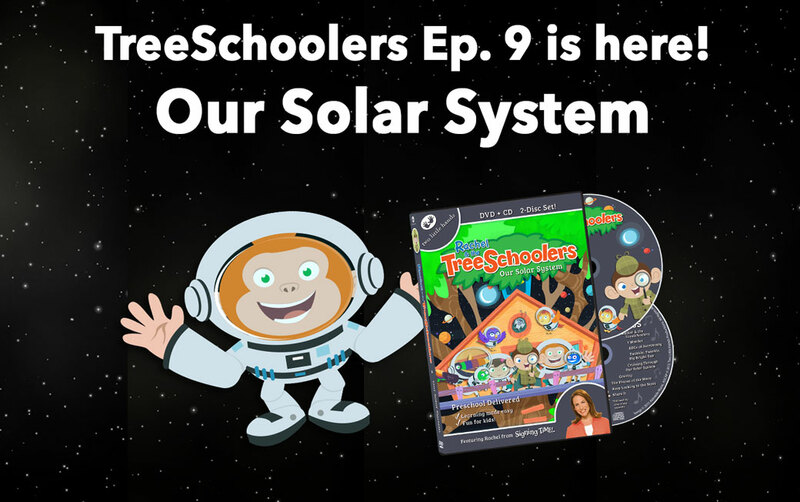 Win Rachel & the TreeSchoolers: Our Solar System! Would you love to WIN your own copy of “Rachel and the TreeSchoolers: Our Solar System” including both the DVD and 8 song CD? ENTER HERE! Want to know more about Two Little Hands Productions? Read all about the company, their humble beginnings, and the incredible work they do >right here<! Thank you, Emily! We really do love our TreeSchoolers!! I never knew that Signing Time was such a family business. The girls love watching it on PBS and I’m excited to learn about the other programs they have to buy. Thanks! This is definitely something I’d love my son watching!